Mushrooms, also called toadstools or puffballs, are fruiting bodies of soil fungi. They appear in lawns during wet weather in spring and summer. Mushrooms live on organic matter such as roots, stumps and boards in the soil. Most don't harm the lawn but are unsightly. Mushrooms that grow in arcs or circles of dark green grass are called fairy rings. The arcs or rings enlarge from 3" — 2' each season as the fungi grows outward. The fairy ring fungus may interfere with water flow through the soil and stress the lawn. There is no chemical control for mushrooms. Time is the best cure. Once the buried wood has completely decayed the mushrooms will disappear. Break mushrooms with a garden rake or lawn mower for temporary control. This helps to dry the mushrooms and reduces the risk of children eating them. Control individual mushrooms by removing the organic matter. Dig up and remove the wood. Fill and reseed, or sod, as needed. 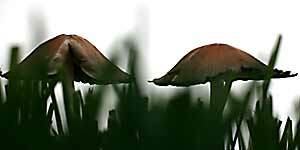 Description: Heavy rains can result in the appearance of numerous slime molds and mushrooms in home lawns. Although these organisms are often spectacular in color and size, most are relatively harmless to the plant life. Slime molds are primitive microorganisms that can produce white, purple, orange or brown blobs or patches of fungus-like material known as sporangia (spores). They can cover turfgrass, strawberries, ornamentals, and numerous other horticultural plants. Slime mold spore masses, when mature, are powdery and break apart easily during rain or when knocked around by your shoes. The spores of the slime mold survive in soil or organic debris and germinate during wet weather to form motile swarm spores. Some of these spores fuse to become amorphous amoeba-like structures that engulf other organisms or organic matter. Slime molds can actually move or flow across soil or plant surfaces. Although unsightly, these organisms are not pathogenic to living plant material. Frequent mowing, raking, or brushing of the spore masses is usually sufficient to control the problem. 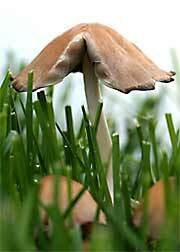 Many different mushrooms can also appear in lawns. Some of these mushrooms are associated with arc-like or circular patterns in turfgrass called fairy rings. The ring pattern is caused by the outward growth of fungal mycelium. The mycelium forms a dense, mat-like structure in the soil that decomposes organic matter. This decomposition releases nitrate into the soil, which in turn stimulates the growth of the grass at the outer portion of the ring. This results in a dark green appearance of the grass at the margin of the ring. Unfortunately, the thick fungal mat formed by the fungus does not allow for water penetration. The fungus may also release certain byproducts that are toxic to the turf. This can lead to dieback of the turf in the ring. Fairy rings are difficult to control. You can sometimes eliminate the ring by digging to a depth of 6 to 12 inches and 12 inches wide on both sides of the ring, refilling the hole with non-infested soil. Alternatively, you can try to mask the symptoms by fertilizing the rest of the lawn so that it is as dark green as the ring. This really isn't a good idea because it tends to promote other turf problems. Recommendations: A couple of fungicides called Prostar and Heritage may help alleviate fairy ring symptoms. These products should be drenched into the affected areas. Repeat applications may be necessary. Unfortunately, these products are not available in retail stores. Some mushrooms in lawns are not associated with fairy rings. These may be mycorrhizal (symbiotic association with tree roots) or live on dead organic matter (wood, etc.) in the soil. Since some of these mushrooms are beneficial, you don't really want to kill them. Besides, a fungicide spray to the mushroom itself does little good. Most of the fungus is below ground and inaccessible to the chemical. If the mushrooms are a nuisance, pick them and dispose of them as soon as they appear. Also remove any sources of large organic debris from the soil. Some of the mushrooms in the lawn are edible, but others are poisonous. Never eat any mushrooms unless you are sure of their identity.